On Friday of last week, I went with a group of girlfriends into Washington, D.C. to attend the Women of Faith conference while the girls finished up their mission week for a final day. I was really sad to miss my last day with Team Beautiful Babes, but I had made plans for the conference a long time ago. The pre-conference on Friday included the incredibly funny Anita Renfroe. If you haven't seen her before, be sure to click on the link. She is truly side-splitting hilarious. The main conference was Friday evening and all day Saturday and included the usual WOF speakers and some incredible musical guests, including Natalie Grant and Nicole C. Mullins. It was such a joy to spend time worshiping, singing, laughing and learning with my Christian sisters....both the ones with whom I attended and the rest of the 16,000 sisters there at the Verizon Center. I am absolutely blown away by the courage and faith of the guests that I am getting to know at the Lamb Center. Today, during bible study, we were talking about how loving God and loving other people are connected (using 1 John 4 as our text.) 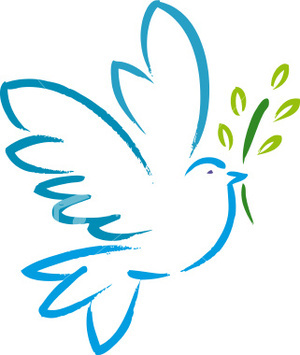 We had been talking about how we access the power of the Holy Spirit to help us in loving people who are hard to love, for one reason or another. I asked the question "how has being a believer...having the Holy Spirit within you...made a difference in how you are able to love others?" I wish I could share the specific words and stories that came as a result of that question, but I'm not sure I could capture it in a way that could really do it justice. One thing I will never forget is the one gentleman who said that, as a result of his growing hunger and love for the Lord, he is "not afraid anymore," Although he is homeless and he has to deal with some very difficult people and situations, he is not afraid anymore because he knows God is with him and is changing the way he looks at the world. In my much safer circumstances, I will remember my friend's humility, faith and hope the next time that I am worried or afraid. I had to go by the elementary school this morning to drop something off and I ran into our favorite teacher. Our family was lucky enough to have Ms. Brown 3 years in a row. She "looped" with my oldest, who had her for 4th and 5th grades. She then decided to go back to her beloved Virginia History in 4th grade the following year, just in time for second born daughter to get her special year with Ms. Brown. As I was walking into the school, I saw her standing there and knew I needed to thank her for her devotion, love and care for my girls. After all, I might never see her again after school ends in a few weeks. As I spoke with her and we marveled at the reality of the girls starting high school and middle school next year, I was overcome with emotion. Even as I participated this week in planning the 6th grade end of year festivities, this time for the last time, I don't think I had really emotionally connected to the idea that our family is leaving behind the comfort and familiarity of this school we know so well. It was all I could do to hold back my tears until I got back to the car. Both girls, praise God, are in a good place right now. Big kids of the school, the oldest ones who know all there is to know about how to manage the everyday challenges of that particular school. The experts....just ask them! It is a good place to be....to feel in control, to know what to expect. They feel confident, competent and in charge. I am happy for them and we are extremely proud of their hard work that has brought them to this place. Clearly, in this example, it is easy to see why they have to leave the comfortable, safe and familiar and take the next step into the unknown. It would be ludicrous to keep them in elementary/middle school just because they are doing well there now. They are outgrowing the place where they are today. They have learned all the lessons that particular place has for them. They don't fit there anymore...it wouldn't be good for them or anyone else in the school for them to stay. In order to keep growing and learning, they have to take the next step....they have to move on. They can't achieve all the potential that God put within them if they stay where they are. How often do we face the same challenge in our faith journey? How often do we....perhaps I should say I...stay too long in a place of familiarity? A place of safety and comfort where we know what to expect and how to get along. This is working for us just fine, thank you very much, so why does God seem to be pushing us to try something new or expand the way we think or open our eyes to another possibility? I finally get this figured out and now I have to learn something new? Even though I have significantly more gray hair than I did when my girls started elementary school, the passage of time has given me some wonderful gifts. The more I see of God's goodness and faithfulness, the more I trust Him and the less I fight Him (mostly!) when He says it is time to move on. I know that whatever He is bringing about for me next is exactly the right place for me to be. There are new lessons to learn and more of Him to discover....more blessings to receive and more ways to be used by Him to be a blessing. In the end, we can't ever forget that He has saved us...set us free...poured Himself out for us so that we can, in turn, pour ourselves out and be a blessing in His Kingdom. Really, in all honesty, do I dare sit back in comfort and safety and refuse to participate in all that He has planned for me just because it is a little scary? What might I miss if I do? I am called to full-time ministry in Jesus Christ. Here is one definition that I found for the word ministry: "Ministry is the use of a person's gifts and talents, time and energy, in the service of others." All of us vary in our God-given gifts, talents, time and energy, so how we "do" ministry is going to look very different for each of us. What does not vary is our call to serve the world. As one of my dear friends has recently told her teenage son, we are not called to be a "sucking hole" on society. We are called to give back, to make a difference, to contribute more than we consume. That all sounds quite lofty and altruistic, but there is laundry to be done and kids who need a ride to soccer. We have jobs to do, expense reports to submit and business plans to finish. For our kids, there is homework to complete, and SOLs and finals for which to study. We are all juggling many responsibilities, when exactly do we find the time to do ministry? Our sermon this morning reminded us that everything we do, including all those things listed above, is ministry when we do it all for the glory of God. When we parent with eyes on Jesus, we offer our children the ministry of encouragement and discernment. When we allow God to be part of our marriages, we serve our spouses with the sacrificial love which Jesus modeled for us. When a friend or co-worker is hurting, in spite of our busy schedules, we have the opportunity to offer them the ministry of presence and encouragement. Even strangers, when seen as other children of God, offer us occasion to make choices for responding in loving kindness rather than defensive hostility or indifference. As we seek to follow Jesus, our eyes are opened to the world around us and we find that we are offered ministry opportunities in ways that we hadn't expected and perhaps never saw before. 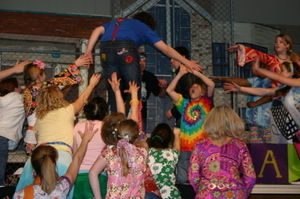 In early 2005, I began to see new ways of doing ministry that I hadn't seen before. I felt God was leading me towards something different, but I was reluctant to step too far outside my comfort zone. This blog was born during that year and, as I recently read back through early blog entries and private journal entries, I see evidence of that exploration. In late 2005, I volunteered to speak at a women's ministry event at our church and experienced a confirmation of God's leading. Over the almost three years that have passed since then, God has proven faithful, patient AND persistent. We just recently finished a very powerful bible study in our Wednesday morning women's group. Written by a bible teacher who is new to our group, Priscilla Shirer, the title intrigued me right from the beginning; "Discerning the Voice of God." Within the pages of the workbook and the video lessons we watched on Wednesday mornings, Priscilla reminded me of much that I already knew about our God and was used by God to teach me new things about His desire to communicate with each of us. She invited us to see what scripture says about God's willingness to speak to us, the ways that God speaks to us, and what our response should be when God speaks to us. The last few weeks were particularly meaningful as she spoke about the somewhat uncomfortable topic of obedience. In those final weeks, God and I wrestled with these questions that I have had about the particular kinds of ministry assignments He has for me. We went round and round about my doubts and my insecurities and my false pride. Finally, I asked for a very particular kind of confirmation...a burning bush, a neon sign, a message that I couldn't deny. A few days later, in the final week of our study, Priscilla asked us to consider making a commitment to obey God by writing and dating the words "Whatever God says, I will do it." She asked us to do that or to ask God what is holding us back from making that commitment to Him. After a few hours of struggling with that idea, I wrote and signed that statement. The next day, I got the exact confirmation from God that I had asked for the week before. Since then, I have been sharing my story and where I believe God is leading me with some of my sisters in Christ. I have been saying YES to God out loud to people whom I trust to hold me accountable. I am saying YES to God out loud here on this blog, because this has been a part of this journey. I don't know the details of what God has in mind, but I am not willing to go back to that stuck place of saying No... maybe...not yet. My true colors bleeding on my sleeve? Instead of wishing for it quietly? Would you still desire what you see? This week in our Online Retreat, we are looking at the sins of the world....yes, something of a heavy topic! We are on Week 5 and I feel like the weekly readings are becoming part of my life. Last week was really powerful; I will probably blog more about that topic later. In the meantime, I had to share some more song lyrics that fit in beautifully with Week 5's topic. My friend and I went to see Michael Card at our church on Saturday night. What a blessing! I was emotionally touched by all the music he played, but this song in particular brought tears to my eyes. It is called Tears of the World. in a blink that is one single day. could catch ev’ry soul up and sweep them away. swept up in one toxic tide. so how could it be that my own eyes are dry? Open my eyes, and open my heart. Grant me the gift of your grieving. just one of the tears of the world. He wept tears as old as the world. and drank ev’ry drop of the poison that heals. So open my eyes, and open my heart. to set our small sadness aside. to follow Him boldly, and wade in the tide. Today, I am feeling very grateful. I am in a good place today, overwhelmed by the God "who cannot be outdone in generosity." I see God's fingerprints everywhere and I am in awe of how He cares about the details of my life. I had the opportunity to pray with my praying mom's group this morning, my honey got home from a trip, the chiropractor visits are yielding results, and my best friend of 30 years is arriving with her kids tomorrow. Actually, we have been friends for 31 years. Wow! I kept playing this song over and over again in my car today. It is an awesome new praise song from Casting Crowns. I thought I would, once again, share some lyrics with you. It's called "I Know You're There." Don, if you are reading this, you have to transpose this into a higher key for me so I can sing it in church sometime!! This just in...I found a video of it, beautiful pics and all!! Now, you can sing along! We are furiously packing for the beach today. My daughters and I auditioned for our church's next musical production this morning and, in preparing for that, I didn't start packing until today...we leave about 6 a.m. tomorrow! 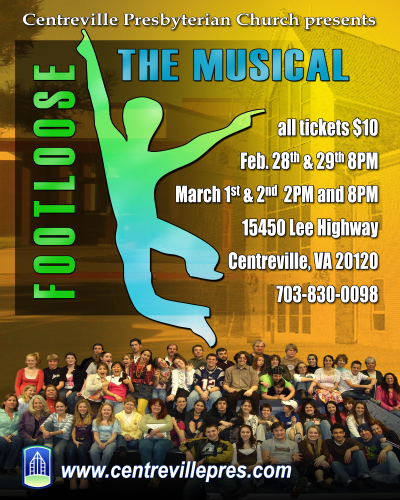 Our next musical will be Footloose. 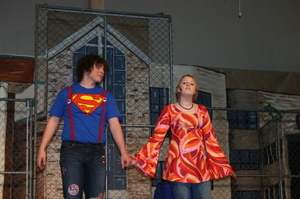 You may remember, that first born child and I were in Godspell this past March. It was an awesome experience and I really want to have the opportunity to be in a production with my younger daughter as well. In fact, that is the whole reason that I am trying out again (other than my incessant love of performing, of course!) This time, they did the auditions like a "real" theatre production, so we had to prepare monologues in addition to learning a song. My kids also had to dance. Thankfully, for all involved, I was NOT required to dance...YIKES!! But, that is now behind us and we are headed for my absolute favorite place on earth!! I leave you with this picture. 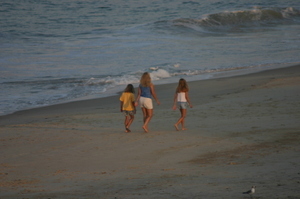 It is me and my auditioning buddies at the beach in 2005. The other is a sunrise pic from last year. 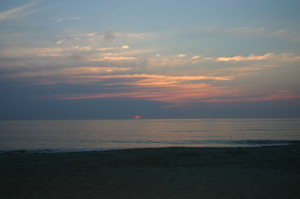 Pretend it is a postcard from me with the words to the Jimmy Buffett song above written on the back!! Talk to you next week! My first born is away at camp this week. She went to this camp last year; her first time away from home for a whole week. Because she was away for the first time last year, I started a tradition of writing her a note for each day she was gone with strict instructions NOT to open them all at once. She LOVED it, so I did it again this year. Because the week is meant to be all about her getting closer to God, I include different scripture verses in each note. Her roommates from last year were amazed that one day, the scripture that I referenced was the same scripture that their speaker had mentioned. Glory! I love it when God shows off in tiny ways that are just for you! Anyway, Sunday evening I had the pleasure of sitting, with my bible on my lap, searching for words to share with my precious one while she was away. My words of love and encouragement and, more importantly, God's Words of love and encouragement. As I flipped through the pages of my bible, I smiled at the many verses that I had underlined and the notes that I had written in the margins. Yes, I do write in my bible...it is a history of my Father and I's journey together. I picked several verses to share with my baby girl that I thought might bless her....sometimes I just went with the one that jumped out at me as I browsed. For some reason, I had trouble falling asleep later that night. As I lay awake, I thought about my experience earlier that evening and expressed my gratitude to God for His Word found within the pages of that book. I thought about how I am changed when I spend time in God's Word and I thought about the different reasons that I don't spend that time as often as I should. How can I describe the way that I am different after time spent reading God's Word? I guess the best word I can find is that I am more tender. My heart...my spirit...is more tender, more porous, more open. I am softer in spirit....less brittle. More flexible, pliable, moldable. Ready to notice God at work, ready to see His glory. Open to His leading, quiet enough to hear His voice. I don't really understand how it works that way and I know there are some days that I read the bible and it doesn't connect. Some days, it just seems like an ancient history book. But other times, I find God there in those pages and I am changed in subtle ways that I can only see looking backwards at my journey. I guess my point is that I am learning that just showing up and opening this Book matters...even if I don't experience a "burning bush" moment everytime. Some times a word or verse does jump out at me and I know God means it just for me. Other times however, it is not the words themselves that tenderize my heart. It is more a deep sense of realization...a KNOWING....that this same God, the God speaking to Abraham, Jacob, David and Peter, is with little me in the quiet of a sleepless night and is with my firstborn in the mountains of North Carolina. I was listening, as I often do, to Nichole Nordeman while I was exercising today. This song makes me cry everytime I hear it and I think speaks to both the bigness AND the smallness of my God. The God that never changes, but continues to change me. I was driving in the car today, listening to my Ipod and this Nichole Nordeman song came on. Although I have heard it many times before, it struck me today how much it connected with the entry I posted yesterday (especially the part I put in bold.) It is called "Anyway:"
Evil, hatred and fear may have had a good week, but we know God still wins in the end. Opening Night tonight! I can't believe it is finally here! For those of you who want to come to the show and don't have tickets yet, tonight is your night. Saturday and Sunday are both sold out! My younger daughter took over 200 pictures at our rehearsal on Wednesday night. Today, I will let the pictures speak for themselves. I wanted to post a bunch of pictures, so they are small. If you click on the individual pictures, they will open into a larger version. Enjoy! Heard this song this morning on the radio. It is sung by the band Avalon, but I could have written the words about myself. I don't know about you, but somedays I get so downhearted that I am still struggling with all the same nonsense. Just when I think God has made some progress with me, I fall back into old patterns of self-will run riot. I love the first few lines of this song..."part of me is the prodigal, part of me is the other brother..." Anybody else feel that way? I love it when God uses music to reassure me that we all struggle sometimes and that, as the song says, He loves me anyway..."always has, always will." Enjoy!